MOSCOW, Idaho — As it’s been pretty much 95 degrees every day since our last Idaho football fix in the giddy triumph at the Potato Bowl, it could be assumed that all had thawed – from the Vandals’ fingers and toes to the quarterback’s relationship with the school president. Except that along about the second quarter of the Vandals’ season opener Thursday night, coach Paul Petrino looked to be on the phone ordering a delivery of frozen blue turf and temperatures in the teens. Hey, the Vandals put up 61 points in the Po-Bowl in Iditarod conditions and set records for most everything, including mittens and post-season fun. 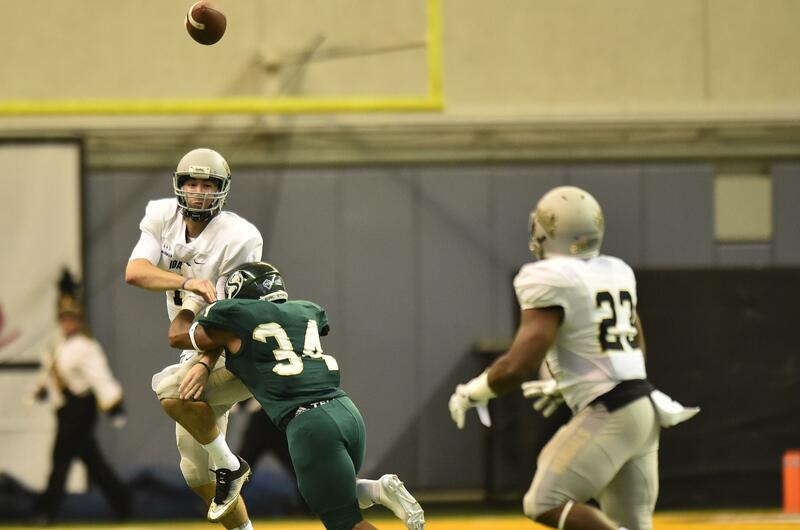 Fifteen minutes into the 2017 season, the Vandals had all of 24 yards inside their little Kibbie Dome greenhouse. Well, it’s takes a pretty big seam to connect December and the eve of September, no? It got better for the Vandals in a 28-6 victory over Sacramento State, but by rights it should have been lower stress – Idaho being a bona fide bowl team and all, and the Hornets’ only distinction being the best 2-9 team in the Big Sky Conference last fall. Matt Linehan had a couple of nifty second-quarter touchdown passes, but also threw two picks, fumbled once and was sacked four times, though it seemed like more. Aaron Duckworth did rumble for 142 yards and freshman punter-kicker Cade Coffey – who only has to replace the legendary leg of Austin Rehkow – was nails. But Vandal palms would have been sweatier had the defense not been as clutch – though the Hornets are pretty one-dimensional, to be kind. But as these endeavors go, this was a keeper. “That’s six in a row,” noted coach Paul Petrino, thinking back to Idaho’s fabulous finish to 2016, “nine of our last 11. We know how to win. Yes, Idaho’s FBS history in purchasing wins at the FCS market is rather checkered – in 22 seasons, there have been seven losses, mostly to Eastern Washington and Montana, and any number of narrow escapes, like last year’s opener against Montana State. Of course, this is the regular company the Vandals will begin keeping again in 2018. Each fall during the long, contentious debate over where Idaho football belonged, the annual FCS opponent loomed as a referendum game, and whipping up on sad Sac at least would have been barstool ammo for those disaffected with the return to the Big Sky. The Vandals were good against the teams they had to be good against last year – “We figured it out toward the end,” was Linehan’s accurate rationalization – and with 13 starters back and veterans pretty much everywhere but on the offensive line, they figure to be good again. They’ll have to prove themselves to be 9-4 good, but with no Washington or Washington State on the schedule, it seems do-able. The FBS-or-bust hardliners will no doubt grump that the decision to drop weight has made momentum pointless. Some must have voted with their wallets and fannies on Thursday night, the jury box was generously credited at holding 10,526. But drawing conclusions from game-to-game gate numbers at Idaho has been a crapshoot during the entire FBS odyssey. The possibility of unprecedented back-to-back bowls is a toy Idaho’s never been allowed to play with, and Petrino is trying to missile-lock his team on the target with a slogan here, a dismissive word there. The FCS future, goes the company line, has no impact on the FBS present. The opposite, Spear claimed, is not true, however. True, now that they’ve finally arrived, they aren’t staying long. But Spear maintained that another bowl game will deliver just as big a message to Idaho’s future FCS recruits. “A prospective student-athlete is going to know if they come to Idaho they’re going to be coached well and be in a position to have success,” he said. But that’s only part of the recruiting Idaho needs to do. In an appeal for more institutional aid last spring, it was projected that there would be a $350,000 drop in donations this year, presumably fallout from the bailout to the Big Sky. It always starts with the scoreboard. The Vandals seem to be getting the hang of that. Published: Aug. 31, 2017, 11:33 p.m.